Haydn’s eight Notturni were composed in 1788-90 to fulfil a commission from King Ferdinand IV of Naples for music featuring his favourite instrument, the lira organizzata. The Neapolitan variety, a popular equivalent of the hurdy-gurdy, incorporated small organ pipes activated by a keyboard. Haydn liked his Notturni well enough to rescore several of them for the famous Salomon concerts in London in 1791-92, replacing the lira parts with flute and oboe. These Notturni are the work of a great composer at the height of his powers, and fully justify Haydn’s faith in them. Derek Smith’s sensitive and inventive reworking of this material for modern instruments is a welcome addition to the wind repertory. 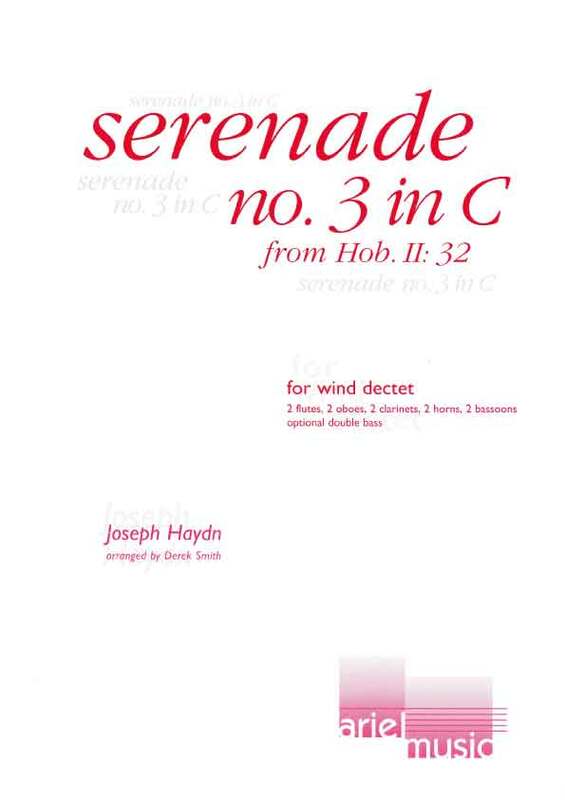 The purpose of this edition is to make this wonderful music widely available in a new arrangement for wind players. Additional dynamics and articulation marks have been added to the original sources to produce a performing, rather than a scholarly text. Metronome marks and additional tempi indications are merely suggestions and are therefore placed between brackets. In Serenade No. 3 alternative parts are available for alto and tenor saxophones, in place of the two horn parts.